"NO2" redirects here. For other uses, see NO2 (disambiguation). 2 is an intermediate in the industrial synthesis of nitric acid, millions of tons of which are produced each year which is used primarily in the production of fertilizers. At higher temperatures it is a reddish-brown gas that has a characteristic sharp, biting odor and is a prominent air pollutant. Nitrogen dioxide is a paramagnetic, bent molecule with C2v point group symmetry. 4) below −11.2 °C (11.8 °F; 261.9 K). The bond length between the nitrogen atom and the oxygen atom is 119.7 pm. This bond length is consistent with a bond order between one and two. The reddish-brown color is a consequence of preferential absorption of light in the blue (400 – 500 nm), although the absorption extends throughout the visible (at shorter wavelengths) and into the infrared (at longer wavelengths). Absorption of light at wavelengths shorter than about 400 nm results in photolysis (to form NO + O, atomic oxygen); in the atmosphere the addition of O atom so formed to O2 results in ozone formation. 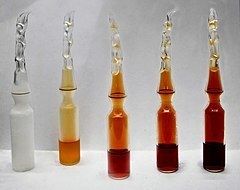 Alternatively, reduction of concentrated nitric acid by metal (such as copper). Or finally by adding concentrated nitric acid over tin; hydrated tin dioxide is produced as byproduct. 4) can be obtained as a white solid with melting point −11.2 °C. NO2 is paramagnetic due to its unpaired electron, while N2O4 is diamagnetic. 2 is a good oxidizer. Consequently, it will combust, sometimes explosively, with many compounds, such as hydrocarbons. This reaction is one step in the Ostwald process for the industrial production of nitric acid from ammonia. This reaction is negligibly slow at low concentrations of NO2 characteristic of the ambient atmosphere, although it does proceed upon NO2 uptake to surfaces. Such surface reaction is thought to produce gaseous HNO2 (often written as HONO) in outdoor and indoor environments. The nitrogen dioxide so formed confers the characteristic yellow color often exhibited by this acid. 2 a trace gas in the atmosphere of Earth, where it plays a role in absorbing sunlight and regulating the chemistry of the troposphere, especially in determining ozone concentrations. 2 is used as an intermediate in the manufacturing of nitric acid, as a nitrating agent in manufacturing of chemical explosives, as a polymerization inhibitor for acrylates, as a flour bleaching agent.,:223 and as a room temperature sterilization agent. It is also used as an oxidizer in rocket fuel, for example in red fuming nitric acid; it was used in the Titan rockets, to launch Project Gemini, in the maneuvering thrusters of the Space Shuttle, and in unmanned space probes sent to various planets. 2 can be a result of traffic from motor vehicles. Indoors, exposure arises from cigarette smoke, and butane and kerosene heaters and stoves. 2 arising from grain decomposing in silos; chronic exposure can lead to lung damage in a condition called "Silo-filler's disease". Historically, nitrogen dioxide was also produced by atmospheric nuclear tests, and was responsible for the reddish colour of mushroom clouds. 2's health effects are caused by the reaction products or their metabolites, which are reactive nitrogen species and reactive oxygen species that can drive bronchoconstriction, inflammation, reduced immune response, and may have effects on the heart. 2 exposure is only likely to arise in occupational settings. Direct exposure to the skin can cause irritations and burns. Only very high concentrations of the gaseous form cause immediate distress: 10–20 ppm can cause mild irritation of the nose and throat, 25–50 ppm can cause edema leading to bronchitis or pneumonia, and levels above 100 ppm can cause death due to asphyxiation from fluid in the lungs. There are often no symptoms at the time of exposure other than transient cough, fatigue or nausea, but over hours inflammation in the lungs causes edema. For skin or eye exposure, the affected area is flushed with saline. For inhalation, oxygen is administered, bronchodilators may be administered, and if there are signs of methemoglobinemia, a condition that arises when nitrogen-based compounds affect the hemoglobin in red blood cells, methylene blue may be administered. It is classified as an extremely hazardous substance in the United States as defined in Section 302 of the U.S. Emergency Planning and Community Right-to-Know Act (42 U.S.C. 11002), and it is subject to strict reporting requirements by facilities which produce, store, or use it in significant quantities. 2 creates ozone which causes eye irritation and exacerbates respiratory conditions, leading to increased visits to emergency departments and hospital admissions for respiratory issues, especially asthma. 2) . With respect to geographic region, the prevalence of asthma has ranged from 2 to 20% with no clear indication as to what's driving the difference. This may be a result of the “hygiene hypothesis” or "western lifestyle” that captures the notions of homes that are well insulated and with fewer inhabitants. Another study examined the relationship between nitrogen exposure in the home and respiratory symptoms and found a statistically significant odds ratio of 2.23 (95% CI: 1.06, 4.72) among those with a medical diagnosis of asthma and gas stove exposure. 2) is especially harmful for children with asthma. Research has shown that children with asthma who live in homes with gas stoves have greater risk of respiratory symptoms such as wheezing, cough and chest tightness. Additionally, gas stove use was associated with reduced lung function in girls with asthma, although this association was not found in boys. Using ventilation when operating gas stoves may reduce the risk of respiratory symptoms in children with asthma. 2) toxicity is dangerous for children. While using a gas stove, it is advised to also use ventilation. Studies show that in homes with gas stoves, if ventilation is used while using gas stoves, then children have lower odds of asthma, wheezing and bronchitis as compared to children in homes that never used ventilation. If venting isn't possible, then replacing gas stoves with electric stove could be another option. Replacing gas stoves with electric ranges could greatly reduce the exposure to indoor NO2 and improve the respiratory function of children with asthma. It is important to keep gas stoves and heaters in good repair so they are not polluting extra NO2. 2015 International Residential Code that requires that vent hoods are used for all stoves and set standards for residential buildings. This requires that all range hoods have a vent that discharges outside. You can also prevent NO2 exposure by avoiding cigarette smoking and not idling your car whenever possible. 2 at 100 ppb, averaged over one hour, and 53 ppb, averaged annually. As of February 2016, no area of the US was out of compliance with these limits and concentrations ranged between 10–20 ppb, and annual average ambient NO2 concentrations, as measured at area-wide monitors, have decreased by more than 40% since 1980. 2 concentrations in vehicles and near roadways are appreciably higher than those measured at monitors in the current network. In fact, in-vehicle concentrations can be 2–3 times higher than measured at nearby area-wide monitors. Near-roadway (within about 50 metres (160 ft)) concentrations of NO2 have been measured to be approximately 30 to 100% higher than concentrations away from roadways. Individuals who spend time on or near major roadways can experience short-term NO2 exposures considerably higher than measured by the current network. Approximately 16% of U.S. housing units are located within 300 feet (91 m) of a major highway, railroad, or airport (approximately 48 million people). Studies show a connection between breathing elevated short-term NO2 concentrations, and increased visits to emergency departments and hospital admissions for respiratory issues, especially asthma. NO2 exposure concentrations near roadways are of particular concern for susceptible individuals, including asthmatics, children, and the elderly. For limits in other countries see the table in the Ambient air quality criteria article. ^ "nitrogen dioxide (CHEBI:33101)". Chemical Entities of Biological Interest (ChEBI). UK: European Bioinformatics Institute. 13 January 2008. Main. Retrieved 4 October 2011. ^ Mendiara, S. N.; Sagedahl, A.; Perissinotti, L. J. (2001). "An electron paramagnetic resonance study of nitrogen dioxide dissolved in water, carbon tetrachloride and some organic compounds". Applied Magnetic Resonance. 20: 275–287. doi:10.1007/BF03162326. ^ a b c d e NIOSH Pocket Guide to Chemical Hazards. "#0454". National Institute for Occupational Safety and Health (NIOSH). ^ a b "Nitrogen dioxide". Immediately Dangerous to Life and Health Concentrations (IDLH). National Institute for Occupational Safety and Health (NIOSH). ^ a b c This article incorporates public domain material from the United States Environmental Protection Agency document: "Nitrogen dioxide". United States Environmental Protection Agency. Feb 23, 2016. ^ Greenwood, Norman N.; Earnshaw, Alan (1997). Chemistry of the Elements (2nd ed.). Butterworth-Heinemann. p. 455. ISBN 978-0-08-037941-8. ^ a b c Holleman, A. F.; Wiberg, E. (2001) Inorganic Chemistry. Academic Press: San Diego. ISBN 0-12-352651-5. ^ Finlayson-Pitts, B. J.; Wingen, L. M.; Sumner, A. L.; Syomin, D.; Ramazan, K. A. (2002-12-16). "The heterogeneous hydrolysis of NO2 in laboratory systems and in outdoor and indoor atmospheres: An integrated mechanism". Physical Chemistry Chemical Physics. 5 (2): 223–242. doi:10.1039/B208564J. ^ "Mechanism Overview, June 2012" (PDF). noxilizer.com. Noxilizer, Inc. Retrieved 2 July 2013. ^ "WHO | Air quality guidelines – global update 2005". www.who.int. Retrieved 2016-10-19. ^ "The Impact of Unvented Gas Heating Appliances on Indoor Nitrogen Dioxide Levels in 'TIGHT' Homes" (PDF). ahrinet.org. 2013-03-21. ^ Chan-Yeung, M.; Ashley, M. J.; Grzybowski, S. (1978). "Grain dust and the lungs". Canadian Medical Association Journal. 118 (10): 1271–4. PMC 1818652. PMID 348288. ^ Gurney, J. W.; Unger, J. M.; Dorby, C. A.; Mitby, J. K.; von Essen, S. G. (1991). "Agricultural disorders of the lung". Radiographics. 11 (4): 625–34. doi:10.1148/radiographics.11.4.1887117. PMID 1887117. ^ Effects of Nuclear Explosions. Nuclearweaponarchive.org. Retrieved on 2010-02-08. ^ a b U.S. EPA. Integrated Science Assessment for Oxides of Nitrogen – Health Criteria (2016 Final Report). U.S. Environmental Protection Agency, Washington, DC, EPA/600/R-15/068, 2016. Federal Register Notice Jan 28, 2016 Free download available at Report page at EPA website. ^ a b This article incorporates public domain material from the United States Environmental Protection Agency document "Nitrogen Dioxide: Health". Retrieved on 2/23/2016. ^ a b c d Heinrich, Joachim (2011-01-01). "Influence of indoor factors in dwellings on the development of childhood asthma". International Journal of Hygiene and Environmental Health. 214 (1): 1–25. doi:10.1016/j.ijheh.2010.08.009. PMID 20851050. ^ a b Garrett, Maria H.; Hooper, Martin A.; Hooper, Beverley M.; Abramson, Michael J. (1998-09-01). "Respiratory Symptoms in Children and Indoor Exposure to Nitrogen Dioxide and Gas Stoves". American Journal of Respiratory and Critical Care Medicine. 158 (3): 891–895. doi:10.1164/ajrccm.158.3.9701084. PMID 9731022. ^ "Historical Census of Housing Tables -House Heating Fuel". www.census.gov. Retrieved 2016-10-19. ^ a b This article incorporates public domain material from the United States Environmental Protection Agency document "Nitrogen Dioxide Basic Information". Retrieved on 2/23/2016. ^ Chapman, Robert S.; Hadden, Wilbur C.; Perlin, Susan A. (2003-07-15). "Influences of asthma and household environment on lung function in children and adolescents: the third national health and nutrition examination survey". American Journal of Epidemiology. 158 (2): 175–189. PMID 12851231. ^ Hansel, Nadia N.; Breysse, Patrick N.; McCormack, Meredith C.; Matsui, Elizabeth C.; Curtin-Brosnan, Jean; Williams, D’Ann L.; Moore, Jennifer L.; Cuhran, Jennifer L.; Diette, Gregory B. (2016-10-19). 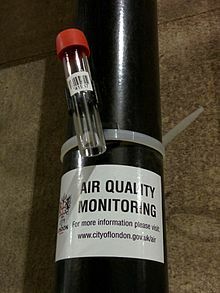 "A Longitudinal Study of Indoor Nitrogen Dioxide Levels and Respiratory Symptoms in Inner-City Children with Asthma". Environmental Health Perspectives. 116 (10): 1428–1432. doi:10.1289/ehp.11349. PMC 2569107. PMID 18941590. ^ Kile, Molly L; Coker, Eric S; Smit, Ellen; Sudakin, Daniel; Molitor, John; Harding, Anna K (2014-09-02). "A cross-sectional study of the association between ventilation of gas stoves and chronic respiratory illness in U.S. children enrolled in NHANESIII". Environmental Health. 13: 71. doi:10.1186/1476-069X-13-71. PMC 4175218. PMID 25182545. ^ "Healthy Child Healthy World". Healthy Child Healthy World. Archived from the original on 2016-10-11. Retrieved 2016-10-19. Haynes, William M., ed. (2011). CRC Handbook of Chemistry and Physics (92nd ed.). CRC Press. ISBN 1439855110. Wikimedia Commons has media related to Nitrogen dioxide.